ROSWELL — A U.S. Army lieutenant who issued a now-famous news release that sparked decades of speculation about whether aliens really crash-landed here in 1947 has died. Walter Haut, a former spokesman for the now-defunct Roswell Army Air Field, died of natural causes Thursday in Roswell, his daughter Julie Shuster said Sunday. He was 83. Haut listened closely on July 8, 1947, as base commander Col. William Blanchard dictated information about a recovered flying saucer and ordered Haut to issue it. The Roswell Daily Record ran a bold headline July 9, 1947: “RAAF Captures Flying Saucer on Ranch in Roswell Region.” The same day, an Army statement was released saying the recovered wreckage was only a weather balloon. “I guess they changed their mind,” Haut told The Associated Press in 1997. Haut said he never was told where the flying disc reported in his news release was found. 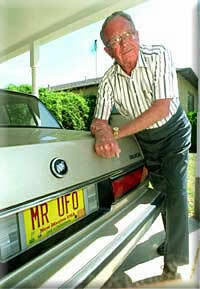 Though he never saw a UFO, he remained a believer. “There must have been something in the skies at that time,” he said in 1997. “There’s just too much evidence.” In 1991, Haut and two other men founded The International UFO Museum where he was president until 1996. More than 2 1 /2 million people have visited the museum since it opened in 1992, Shuster said. It wasn’t until the late 1980s that Shuster said she and her sister learned about the Roswell incident. But they didn’t hear it from their father; they read about it in a book. “It was not a topic of conversation at the dinner table for anybody involved,” she said. 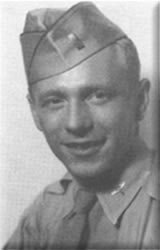 Haut, born June 3, 1922, in Chicago, is survived by his two daughters, Shuster and Marabeth Fields of Roswell, three grandchildren and four great-grandchildren . A viewing is scheduled Monday in Roswell at the LaGrone Funeral Home. A funeral service is set for 11 a.m. Tuesday at Trinity United Methodist in Roswell.